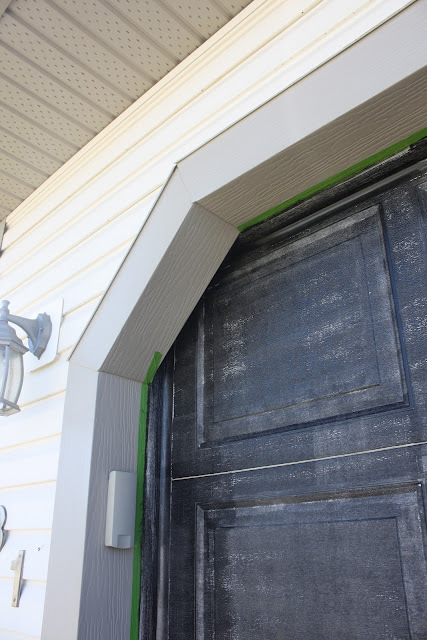 She Re-Purposed It: How to paint your garage & front door! How to paint your garage & front door! Today's post is actually going to be a mini tutorial. With lots of pictures (because I'm a visual learner). This was yesterdays project. Operation paint the front door. When I posted the picture I had a few ask for a tutorial on how it was done. Well....I didn't originally plan on blogging about it so I kinda, sorta, didn't take any pictures of the process. Oops! But don't fret I was already planning on painting my garage door so ill use that for the tutorial and adjust tips where needed. Step 1. Assemble your supplies! In my opinion Frog Tape is the best you can buy! You'll also need a cleaner to wash down the surface. Plus your painting tools. I recommend using a small SPONGE roller. 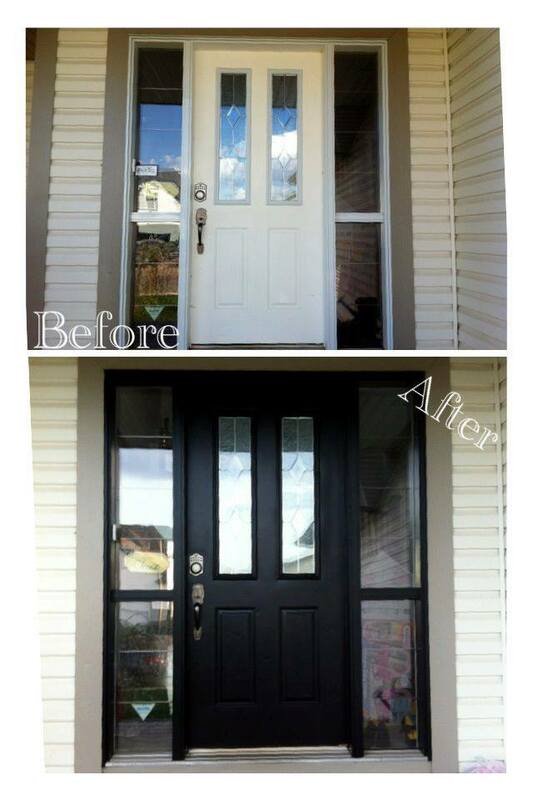 If you are painting your door a color be sure you get them to mix the EXTERIOR paint that says ACCENT BASE! Step 2. READ THE CAN!! Take it from me...who didn't. I thought "I'm a big girl, I paint all the time...I got this!". Then I got mad and finally read the can! When it recommends waiting 4-6 hours between coats...LISTEN! Its for your own good. Applying the paint too quickly will only start to take off the first coat and show roller lines and brush strokes. Frustrating! Step 3. Wash down the entire door. Step 4. Tape off anything you do not want painted (Ie. Siding, Trim, Door Knob, Lock ect)...do not skip this step...you'll be sorry. Make sure you get up into all the areas even though you think you may never see them, no cutting corners if you want a professional look in the end. Step 6. Allow the paint to dry for a complete 4-6 hours before re coating. VERY IMPORTANT! Step 8. Remove the tape and admire your NEW door! (I even had a neighbour come over and tell me it looked great! Don't be surprised if you do too). Here it is now with the front door, garage door and deck painted! I hope you liked today's tutorial! If you have any questions please leave me a comment and Ill try my best to help. Oh wow, what a change! Looks wonderful! The black paint update is great! 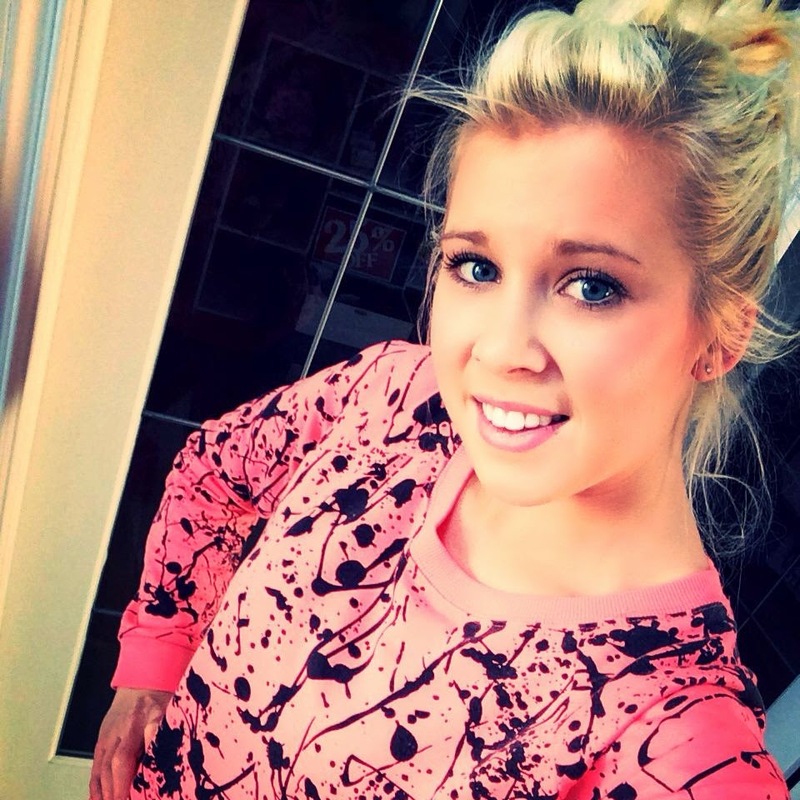 You are a brave girl! I always say "it's just paint". Easy to change. Thank you Deb! I totally agree, If I try it and dont like it I can always do another coat! I am definitely the painter in our house, its a lot of work and ill be honest sometimes I get so sick of it that I dont want to see another brush but what keeps me coming back is seeing the before and after shot! I hope you love your results when you are done! Thanks for dropping by and leaving a comment! Looks awesome! 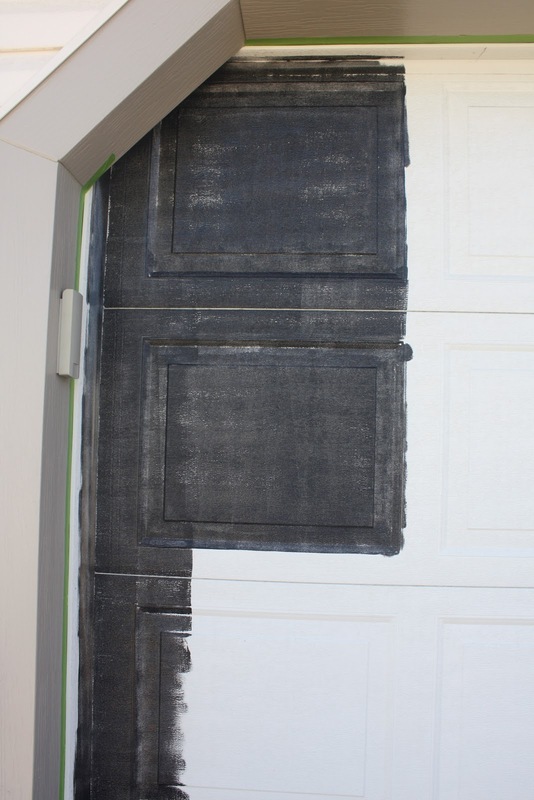 My husband was looking to buy a new "black" garage door - but now will paint it in. Was your garage door metal? I actually believe it was plastic but this outdoor paint is good for both metal and plastic, my front door is metal :) hope you try it out! just painted the front door and shutters at my house last week! where was this before then? my front door which I thought had turned out pretty well actually looks a mess I the bright afternoon sun. Do you think it would be overkill to try to put on one more coat with the sponge roller, (as I used a brush) to even it out? Thanks for your painting tips, Christina! The entire repainting job is never easy, from choosing color, kind of paint, to the actual process itself can be physically and mentally draining. Where did you learn to paint, by the way? You sound and work like a professional! Good job! Oh thank you very much! I have no professional training just a lot of research and trial and error! Thank you so much for your kind words its great to know people appreciate what I do! Thanks again. What is the paint and is it just black metal paint? Hi! 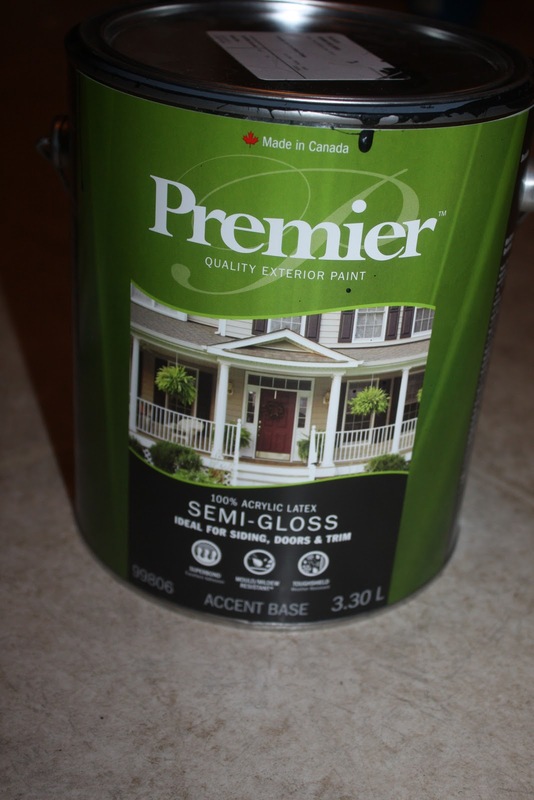 There is a picture of the can in the post :) its an exterior paint for plastic and trim. Hope this helps! 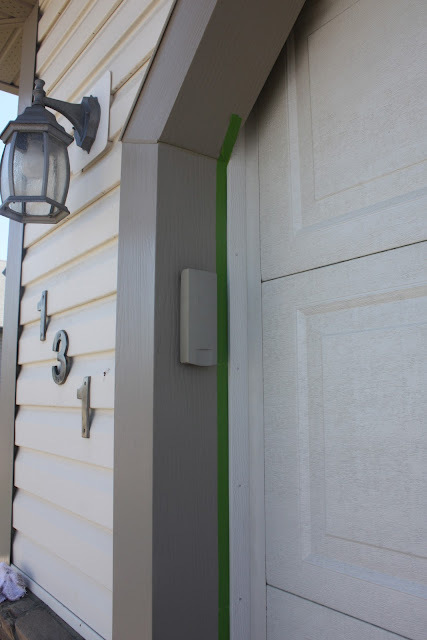 There is a way to paint each section of the garage door separately, so there is paint in between each panel as well. Would be silly to see white/other color than new paint color, in between each panel, as the door is being opened/closed.Can find the tutorial on Pinterest. What are the outside colors that were used on the house and trim?